the crossing at certain points on its front, while on either flank the Germans who had gained a footing pressed forward. Our men, firing in three directions, met the German attacks with counterattacks at critical points and succeeded in throwing two German divisions into complete confusion, capturing 600 prisoners. 16. The selection by the Germans of the Champagne sector and the eastern and southern faces of the Marne pocket on which to make their offensive was fortunate for the Allies, as it favored the launching of the counterattack already planned. There were now over 1,200,000 American troops in France, which provided a considerable force of reserves. Every American division with any sort of training was made available for use in a counteroffensive. Gen. Petain’s initial plan for the counterattack involved the entire western face of the Marne salient. The First and Second American Divisions, with the First French Moroccan Division between them, were employed as the spearhead of the main attack, driving directly eastward, through the most sensitive portion of the German lines, to the heights south of Soissons. 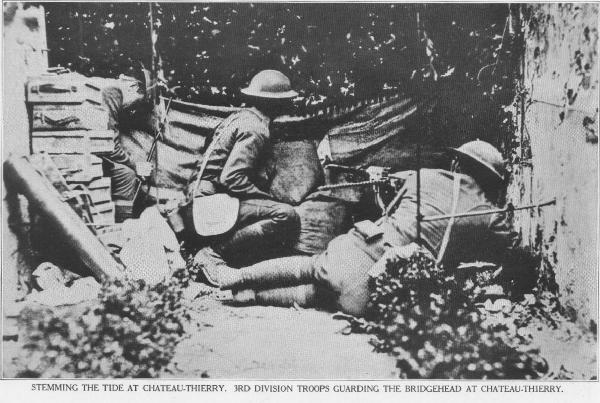 The advance began on July 18, without the usual brief warning of a preliminary bombardment, and these three divisions at a single bound broke through the enemy’s infantry defenses and overran his artillery, cutting or interrupting the German communications leading into the salient. A general withdrawal from the Marne was immediately begun by the enemy, who still fought stubbornly to prevent disaster. The First Division, throughout 4 days of constant fighting, advanced 11 kilometers, capturing Berzy-le-Sec and the heights above Soissons and taking some 3,500 prisoners and 68 field guns from the 7 German divisions employed against it. It was relieved by a British division. The Second Division advanced 8 kilometers in the first 26 hours, and by the end of the second day was facing Tigny, having captured 3,000 prisoners and 66 field guns. It was relieved the night of the 19th by a French division. The result of this counteroffensive was of decisive importance. Due to the magnificent dash and power displayed on the field of Soissons by our First and Second Divisions the tide of war was definitely turned in favor of the Allies. Other American divisions participated in the Marne counteroffensive. A little to the south of the Second Division, the Fourth was in line with the French and was engaged until July 22. The First American Corps, Maj. Gen. Hunter Liggett commanding, with the Twenty-sixth Division and a French division, acted as a pivot of the movement toward Soissons, capturing Torcy on the 18th and reaching the Chateau-Thierry-Soissons road on the 21st. At the same time the Third Division crossed the Marne and took the heights of Mont St. Pere and the villages of Charteves and Jaulgonne. In the First Corps, the Forty-second Division relieved the Twenty-sixth on July 25 and extended its front, on the 26th relieving the French division. From this time until August 2 it fought its way through the Forest de Fere and across the Ourcq, advancing toward the Vesle until relieved by the Fourth Division on August 3. Early in this period elements of the Twenty-eighth Division participated in the advance. Farther to the east the Third Division forced the enemy back to Roncheres Wood, where it was relieved on July 30 by the Thirty-second Division from the Vosges front. The Thirty-second, after relieving the Third and some elements of the Twenty-eighth on the line of the Ourcq River, advanced abreast of the Forty-second toward the Vesle. On August 3 it passed under control of our Third Corps, Maj. Gen. Robert L. Bullard commanding, which made its first appearance in battle at this time, while the Fourth Division took up the task of the Forty-second Division and advanced with the Thirty-second to the Vesle River, where, on August 6, the operation for the reduction of the Marne salient terminated.